Notice something outta place? Maybe that hard disk lying on the bottom of the case is a hint? What about the fact that two hard disks actually in the case are disconnected? Now, that’s not all folks. It is an SBS 2003 R2 server with only 1GB of RAM! Apart from SBS 2003 and Anti virus, the server is also running in this 1GB of RAM, a virtual machine that had a linux distro to do the anti-spam (not very well either – hello Intelligent Message Filter). Strangely enough (well, not really), the old IT person moved interstate and now won’t return any of the client’s phone calls. Strange that eh? A. All IT companies aren’t trying to rip them off. B. There is a big difference between IT providers. You get what you pay for basically. However, I do understand this from a customers point of view. How the hell do they know if an IT person is good or bad? They don’t know IT, that is why they pay someone to do this. It seems today that businesses only understand the difference after they have been burnt! However, it really does give the rest of us that are trying to do the right thing a bad name. Thank goodness that I believe in karma (really nasty payback karma, but karma none the less). Having recently setup a Proliant ML110 G5 Server with Windows 2003 SBS we encountered an unknown device in the Device Manager. The reason for this was that we prefer to blow away the OEM setup and rebuild from scratch. That way we get the server exactly the way we want it. This is a bit of a pain since you need to reload all the drivers manually. Everything seems OK except there is one item in Device Manager with Unknown Device Properties. The details of this item have a Device Instance ID of ACPI\IPI0001\0 and Hardware IDs of ACPI\IPI0001 *IPI0001. Boy, they certainly make it hard don’t they? Overall they are pretty good and run for about 90 minutes each. Some of the earlier ones I found to be a little disjointed and rather rushed but I suppose they needed to get all the content covered. I think however this illustrates the problem with communicating the value of Sharepoint. far too often people try and show you everything it does rather than just what the viewer want to do. As most techie types salivate over the imminent release of Small Business Server 2008 I will contend that this will in fact be the last version every produced. What do small business customers want? Simple. They want access to their “stuff”. What is their stuff I hear you ask. Well, it is probably “stuff” they create as well as “stuff” other people send them. In more technical terms “stuff” they create are documents and “stuff” other people send them is emails. Why do they need a server to access their “stuff”? They don’t. Managing a server for their “stuff” has become way too complicated and way too expensive for most small businesses. They have to firstly buy the equipment, next they have to run it up and get it all working. Next, they have to keep it secure and so and so on. If they can’t do this themselves they pay someone else to do it for them but it still pretty expensive just to access their “stuff”. Customers don’t care about servers. They also don’t care about software. They just want something that will allow them to do their job – i.e. get access to their “stuff”. It seems that things like servers and software are simply getting in the way of this. I reckon more and more are going to be migrating to “cloud computing” since it all far easier to access their “stuff” here. Look, Small Business Server (SBS) has been a great product over the years. It really has. It has been an extremely cost effective method of doing much that a small business needs but not any more in my books. Everything that SBS can do is now begin done in the “cloud”. As a customer, why would you ever want to maintain your own mail server? Put it in the “cloud” and let someone else manage the problems of spam a smart operator will say. If you really think about it there isn’t really much that SBS has over “cloud” computing. Now sure, many clients aren’t comfortable with the the idea of accessing their “stuff” somewhere on the Internet but hey if I tell them that they can do it for half the cost, guess how long it will take most to change their attitude? Half a nano-second I’ll bet! So no customer really cares about SBS and all the technical gee-whiz. If they can find a cheaper and easier way to get their “stuff” they go for it. The second front on which SBS faces annihilation is from Microsoft. Microsoft seems clearly to moving towards the concept of “medium” rather than “small” business servers with its release of Essential Business Server (EBS) which basically is similar to the current SBS but allows all the software to run on multiple machine (unlike SBS). Why? Businesses that are going to run EBS are bigger and far more likely to spend far more dollars on IT than “small” businesses who buy SBS. For those clients even Microsoft is pitching its own “cloud” computing solution, which is even evident in the upcoming version of SBS 2008. The way I see is that SBS is being “stripped” down and “consumerized” so all it does is simple store “stuff”. Since it has been 5 years now since the last version of SBS was released (and SBS 2003R2 doesn’t count as a “new” release). I can’t see that in another 5 years we’ll have SBS 2013. I’m sorry, but I think it will be gone. If you are selling and supporting SBS then I reckon your time left to make money with the product is fast dwindling. You have either to move up market with EBS (which will be tough for one man bands) or embrace “cloud computing” (but if everything works right why do customers need you?). So maybe it is not only the end of SBS as we know it. Maybe it is also the end of the SBS only reseller? 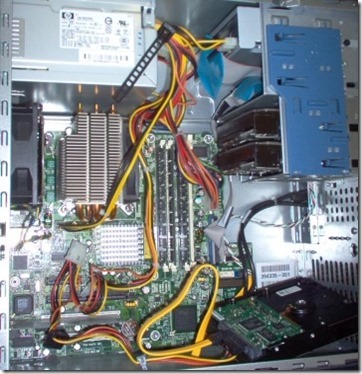 So you want to configure the embedded RAID array on a HP ML110G5? Well, first thing you have to do is go into the BIOS (via F10 at boot) and select the Advanced menu. From Advanced menu item select Advanced Chipset Control. Then set the Serial ATA field to Enabled, select SATA Controller Mode Options -> Enhanced field and set the SATA RAID Enable field to Enabled. Press F10 the Yes to save and the server will reboot. Utility found, Loading wait …. So you download the file, unpack the files to you workstation hard disk and run the utility that allows you to create a bootable USB device (anyone know what these things called floppies are? I can’t remember ever seeing one ). Insert that into the server, the server boots to the device, runs some updates, reboots, finishes updating and when I now press F8 at the RAID controller config I can finally get in and configure my drives for RAID. Generally, it is always a good idea to update all the firmware prior to the installation of any new server. Why? Simple. It’s the first thing the manufacturer is going to ask you to do if there are problems and I’d sure as heck rather do it on a system I’m running up rather than a production server if I can avoid it! Normally the first question I get asked after I tell people that they can run Sharepoint v3 on a Windows Small Business Server 2003 is whether it will work through Remote Web Workplace. Problem is that, by default you must install Sharepoint v3 on Small Business Server 2003 in parallel to existing Sharepoint v2 that comes with Small Business Server 2003 (in place upgrades break things!). Now, Sharepoint v2 is known as http://companyweb to users within a Small Business Server 2003 network. So to work with Remote Web Workplace you would need to have http://companyweb point to the new Sharepoint v3 site installed in parallel on the Small Business Server 2003. Is this possible? It certainly is. You basically need to do some swapping of DNS records and extending of Sharepoint virtual servers (in both v2 and v3). However, the bottom line is that you can get a Sharepoint v3 site to appear in Remote Web Workplace. Buuuuut, the question is that this certainly would be “non-standard” and unsupported by Microsoft. There is also a good chance that any updates that come out in future may have a problem because they are expect to see Sharepoint v2 at http://companyweb not Sharepoint v3. However, if you REALLY, REALLY want to do it, then it can be done in a way that allows you to roll back if necessary when updates come out. So how is it done? If you want to know then I suggest you subscribe to my Windows Sharepoint Operations Guide at http://wssops.saturnalliance.com.au. In here I have documented the steps as well as providing screen shots of just about every step to make it nice and easy. That section alone is currently over 50 pages and growing but relies on other parts of the guide to illustrate the process, which I do not plan to replicate here. I should also mention the fact that I have spent quite a few hours testing and documenting the whole process. If you are planning on working with Windows Sharepoint especially on Windows Small Business 2003 then, I believe, my Windows Sharepoint Operations Guide represents a very small investment for the time savings it is going to give you. A really good example of that is getting Sharepoint v3 working as http://companyweb on a Small Business Server 2003. The good thing is that existing Windows Sharepoint Operations Guide subscribers will get all this information as part of their next subscription update! Now I think this applies as much to personal relationships as it does to business relationships but I’ll examine this in light of a business relationship. So you “network” with someone new and you exchange business cards and promise to contact each other in the future, as we all have at sometime or other. Now what has really happened is that you have both opened up a “business relationship bank account“. In most cases neither party actually uses it because they go their own separate ways and never talk again (great networking eh?) but let’s say that the parties do want to develop this relationship into something. So both parties now start conversing, meeting and getting to know each other. In other words both are making deposits into their “relationship bank account” in more or less equal amounts. Now let’s suppose one party needs something from the other party. To do this they must make a withdrawal from the “relationship bank account” but that is no problem since they have plenty of credit built up. Once they have made this withdrawal they will continue to make deposits to pay back this loan and continue improving the health of the account. In a perfect world this continues on with both parties investing more and more in the relationship and making withdrawals when required. However, as time goes by each party is happy to keep the “relationship bank account” open and making payment because they know they are getting a return on their investment. Neither party’s account is ever in the red and the relationship continues to flourish. Ah, now to the real world. Typically, these days when someone opens a “relationship bank account” with you in business they want to make withdrawals immediately. They want a line of credit before they have even invested dollar one! Also, in many cases the contributions they make are so small that the other party begins to question whether they are getting taken for a ride. So many people in business want to have a relationship with your business but then either don’t contribute to that relationship or want to start making withdrawals immediately. If people don’t try and make withdrawals immediately from the account they try and deposit bad cheques. You know this when you hear, “Oh, yes I’ll do that and get back to you” or “Let me arrange something and let you know”. What happens? You hear nothing. These people aren’t interested in making “real” deposits into the account. Clearly they don’t see any value in holding up their end of the bargain so they simple deposit bad cheques that that are worthless but are easy to write. Come on, if you don’t want to contribute to our “relationship bank account” just say so and we’ll go out separate ways. Unfortunately, many people in these sorts of relationships don’t look at the relationship with a “banker’s eye”. By that I mean they need to assess whether the partnership they have formed is actually providing them value. If they are providing credit to the other party and making the bulk of the investments in the relationship are they getting a good return? At some point they should say, look this isn’t working out so either you invest more in our mutual “relationship bank account” (with interest and penalty fees for being a fathead) or I’m closing the account. Sadly, most “business relationship bank accounts” you have should be closed if you examine them pragmatically but for “emotional” reasons people don’t. If you feel you are getting the short end of the straw somewhere, examine the relationship in terms of an investment. Are you getting good returns? Are you likely to get good returns in the future? If not, cut you losses and invest elsewhere because relationships of all forms are a two way street!